September should see a big mood shift, as the Wall Street tastemakers are chauffeured back from the Hamptons, send their distracting offspring off to some posh boarding school and finally get back to the business of moving markets. It all starts with today’s nonfarm payrolls report. The fun should continue next week with the Apple unveil and a potential IPO from Chinese Internet beast Alibaba (more on this below). We seem to be on a bit of an IPO bender this year, already surpassing the number of filings from all of last year. Still, the bear’s paradise of September is well documented. But what isn’t is the flip side. This is historically a fantastic stretch for gold, and it couldn’t get here soon enough for an investment that’s down almost double-digits in the past year. 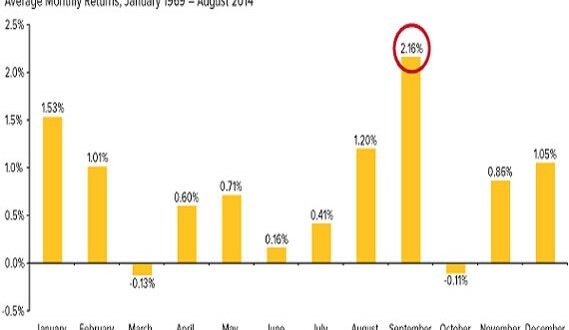 “September is historically gold’s best-performing month of the year, returning 2.16% on average since 1969,” said Frank Holmes, chief investment officer of US Global Investors.